There is no better way to enjoy the majesty of Yosemite National Park then by putting on a pair of boots and hiking the mountain trails, walking among giant sequoias, or standing in the mist of a waterfall. 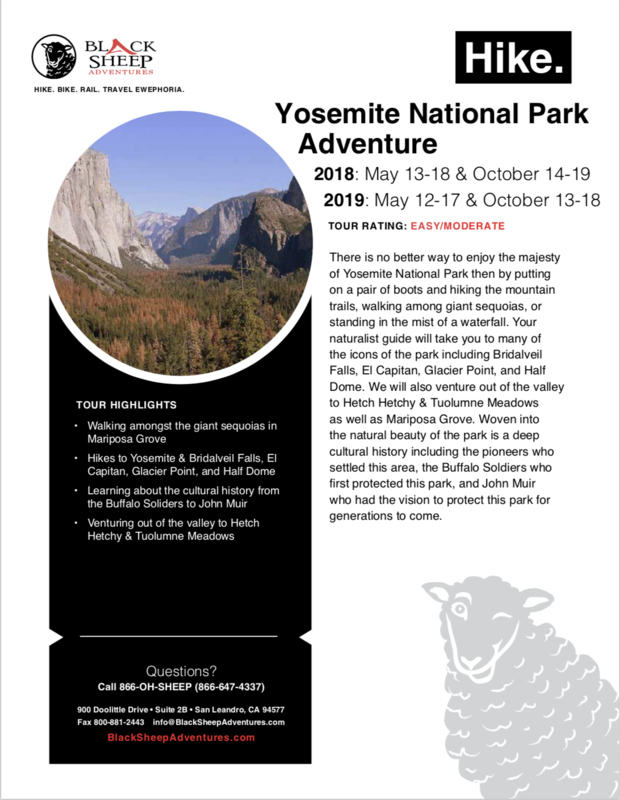 On our Yosemite Tour your naturalist guide will take you to many of the icons of the park including Bridalveil Falls, El Capitan, Glacier Point, and Half Dome. We will also venture out of the valley to Hetch Hetchy & Tuolumne Meadows as well as Mariposa Grove. Woven into the natural beauty of the park is a deep cultural history including the pioneers who settled this area, the Buffalo Soldiers who first protected this park, and John Muir who had the vision to protect this park for generations to come. This Victorian era hotel features wrap around verandas in each of the six buildings where you can relax on an Adirondack chair as you soak up the beauty of Yosemite. The lodge is situated in a large grove of trees and right above the Pioneer Yosemite History Center in the southern end of the park. The perfect base camp to explore the park you are just a short walk from Yosemite Falls and the rest of the valley. Its architecture is designed to blend into the surrounding natural beauty of Yosemite while offering remarkable views of the park. Our hike today starts right from the lodge on one of the oldest trails in the park originally constructed in the 1870s to Yosemite Falls. You will have options for a hike ranging from 2-7 miles to a magnificent viewpoint of the Upper Yosemite Fall or all the way to the top of the falls at 6,500 feet. We will enjoy dinner at the Majestic Yosemite Hotel including a tour to learn more about the architecture and history of the hotel including the famed Firefall.